The Ling-Temco-Vought (LTV) XC-142 was a tri-service tiltwing experimental aircraft designed to investigate the operational suitability of vertical/short takeoff and landing (V/STOL) transports. 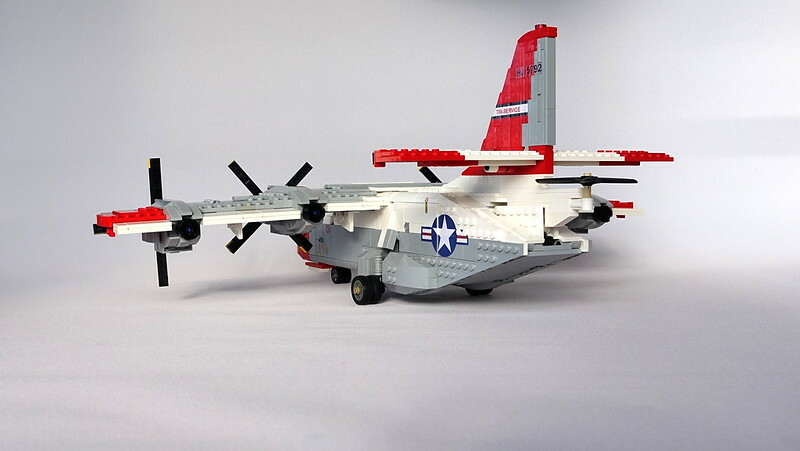 The Ling-Temco-Vought (LTV) XC-142 was a tri-service tiltwing experimental aircraft designed to investigate the operational suitability of vertical/short takeoff and landing (V/STOL) transports. An XC-142A first flew conventionally on 29 September 1964, and on 11 January 1965, it completed its first transitional flight by taking off vertically, changing to forward flight and finally landing vertically. Its service sponsors pulled out of the program one by one, and it eventually ended due to a lack of interest after demonstrating its capabilities successfully. My fascination for the experimental V/STOL aircraft XC-142 has always been huge. I think I saw it for the first time in a French Sci-fi comic album in my teenage years. Even though it never left the prototype stage, I think it was a very important stage towards the Bell XV-15 and the later Bell/Boeing V-22 Osprey. Here the sideentrace is opened. It is hinged on a double linkage to allow the 3 plate thick door to be pulled out before it swings open. I started designing this model in September 2018, and initially I had no plans for adding any functional features, except that at least the wing should be able to tilt like the real aircraft. When I realized how big it would be, I thought there would be room enough for an electric motor inside the fuselage which could drive the propellers through axles and gears. Here the side of the cockpit is removed to show you that the model contains a cockpit interior with instruments and steering column for the two pilots. On the real plane all engines are interconnected through axles and gears, so that the loss of power on a single engine wouldn`t be catastrophic. It also synchronizes the propellers so that each propeller on the same wing-side is offset 45 degrees to each other. 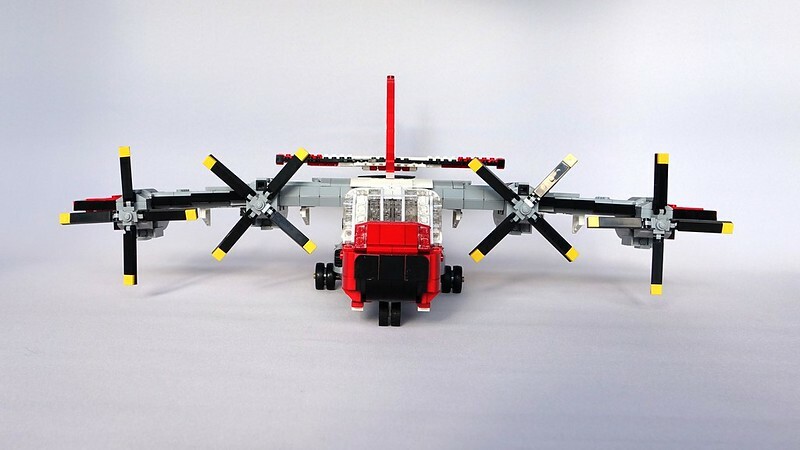 All of this, I tried to replicate with my model, and spent way too much time designing it, just to realize that because of a flaw in the LDD designer program, some of the gears had way too much friction to let the propellers spin freely. Had I known of the troubles with the propeller drive, I guess I wouldn`t have spent so much time tinkering with the landing-gear and wing tilt mechanism, because these also had to be modified to work better. And even after modification they don`t work perfect. Lesson learned: If you`re planning to make Technic functions, make real tests with real parts, not with LDD! One thing however works OK, The cargo ramp! The cargo ramp open in more sections, the cargo ramp for loading goods inside the plane, and the upper doors folding under the tail rudder. The wedge-piece covers the gap under tail when the cargo doors are closed. A direct front �view showing the anhedral angle of the main wings. The model is quite heavy, weighing almost 1,3 kilograms. Getting a little tired of redesigning, I decided to just stop here and present my model as it is. So the wing still contains most of the axles and gears, (some of it visible on the underside) but unfortunately none of it is functional. Nothing is so bad that it isn`t good for something else. Letting go of the propeller drive I could change the propellers for a more accurate looking one with a small pitch to the blades. Quoting Petey Bird I didn't know this airplane so I had to google it. Guess what? Looks exactly like the real thing! I especially like the glasswork on the cockpit. Really, really smooth. Thank you very much for this delightful comment Petey Bird! It`s the kind of comment that makes it worth still posting on MOCpages! I didn't know this airplane so I had to google it. Guess what? Looks exactly like the real thing! I especially like the glasswork on the cockpit. Really, really smooth. Thank you very much Adam! Quoting Nick Barrett Wow, that's pretty spectacular. Sounds like the design process would be a lot more enjoyable if you'd skipped the LDD. I had no idea that the system was so flawed, although I've never used it. Thanks for the Wow, Nick! I`ve learned my lesson, trying to design the Technic drive, but LDD is still a great design tool when it comes to getting the shape right, because you can have pieces "floating" around without being connected and they still maintain their position, and then later you can work on getting things connected. Wow, that's pretty spectacular. Sounds like the design process would be a lot more enjoyable if you'd skipped the LDD. I had no idea that the system was so flawed, although I've never used it. Quoting Beni Henzen Original MOC. Fantastic, many details and funktions. Good work here, 5/5. 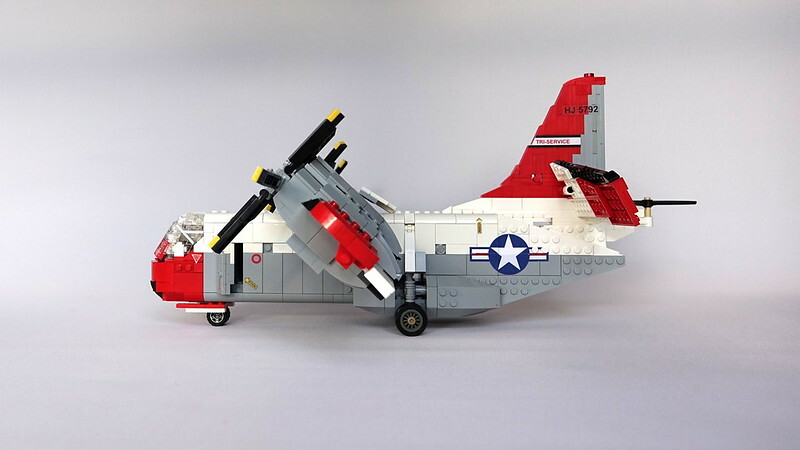 Original MOC. Fantastic, many details and funktions. Good work here, 5/5. Quoting Jeremy McCreary Very impressive, Henrik! Lots of cool functionality. Thank you very much Jeremy, much appreciated! Very impressive, Henrik! Lots of cool functionality. Quoting Kurt's MOCs Beautiful model, Henrik! A great subject for a model as well, since it was such an odd little aircraft. Everything looks spot on and I love the cockpit design. It reminds me of the Canadair CL-84, which I've thought about building for a while now. Thank you very much Kurt! I`m glad you like it, and I agree, it is an odd little aircraft, but that`s what make it cool. In my search for information about the LTV XC-142, I`ve often come across the CL-84 too, and both aircrafts very similar in techniques. I guess the CL-84 would be a great choice for you since it`s Canadian. Beautiful model, Henrik! A great subject for a model as well, since it was such an odd little aircraft. Everything looks spot on and I love the cockpit design. It reminds me of the Canadair CL-84, which I've thought about building for a while now. Quoting BATOH rossi great Henrik! this is not only a well-shaped static model, but also has working details, in minifig scale ... exceptional! Thank you very much BATOH Rossi, I�m very glad you like it! great Henrik! this is not only a well-shaped static model, but also has working details, in minifig scale ... exceptional! Quoting Seaman SPb Excellent work, Henrik! Thank you very much Seaman! Quoting john lamarck Sorry to hear that the engines aren't working but that was quite a challenge. It is indeed a challenge to make it work, and I might get back to it later! Quoting Michael P Beautiful aircraft! The detail work is astounding! Thank you very much Michael P, much appreciated! Quoting Lego Fire Museum Inc. This is a masterpiece. Great build, great details and a great story. Thank you very much L.F.M.Inc.! Really great to have your comment! Quoting Sven ;o) Henrik my friend, you did again a marvelous job on this one. Really like how you manged to build the cabin with all the trans clear parts. Overall a great lookin aircraft with many nice building solutions and functions. Thank you very much Sven! As always your comment is very much appreciated. I wish the selection of Trans-clear parts was bigger, but on the other hand it makes the design challenge even bigger. Quoting A Taylor Wonderful work. It looks great and the history is excellent. Thank you very much A Taylor, I`m glad you like it! Quoting Clayton Marchetti Magnificent job! I love how you made the canopy. The side window looks very intricate. I feel your pain in regards to the axels and gears. Thank you so much for the compassion Clayton, I might try to rework the features later, but for now I just need to move on to something new. Quoting Meepinater C. Wow, this is amazing! The detail, shaping, colors, mechanisms, techniques.... 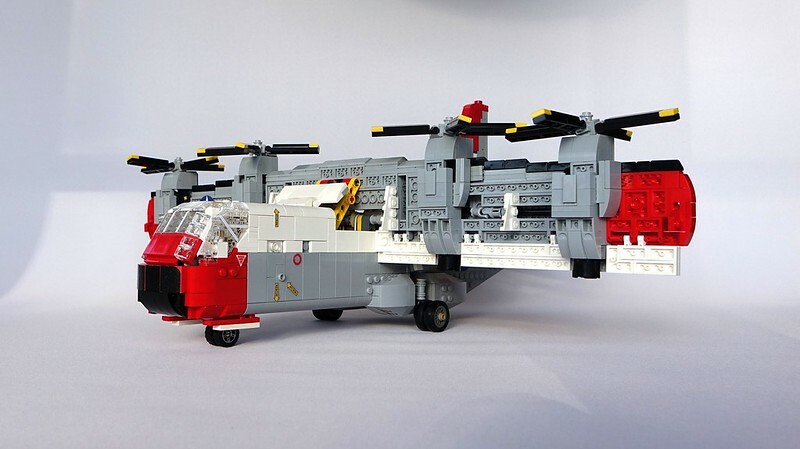 It all meshes together to create this amazing MOC. Good job, and keep it up! Thank you very much M.C., it sounds like you`ve checked out my Flickr posts as well! Quoting Tom's MOCs Simply terrific, Henrik! When I saw what you chose to model, I thought: Well, it has finally happened --- someone else posted their version before I did mine. I created mine quickly over a year ago, but held it back because I couldn't get LDD to swivel its tilt-wing (sound like a familiar issue in LDD, yes?). My model is smaller and starkly simple (you might think it Duplo, not Lego), but at least I managed to get a movable rear loading ramp. 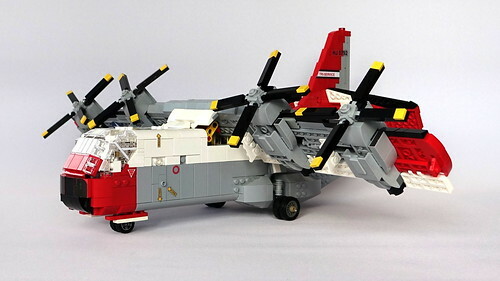 I won't publish mine - I would rather refer people to yours, and right now no one else has the LTV XC-142 on MOCPAGES. You own this space! Thank you very much Tom! 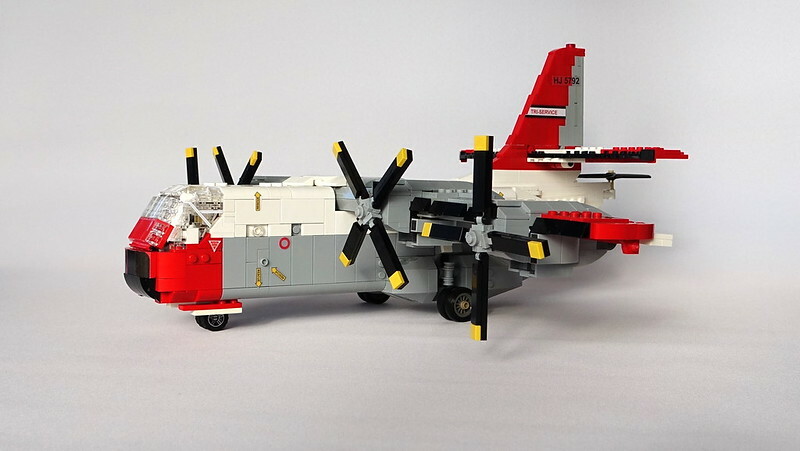 Making it in a smaller scale will of course leave less space for working features, but I choose to make mine in the same scale as all of my other planes, 1:40, considered as Minifig-scale. Your problem with tilting the wing could be if you have more than one hinge attached to wing/fuselage it can cause problems, or if there are "floating parts" in the wing-assembly. Thanks again for your very nice comment! Thank you very much Jim! The goal of making the transmissions in the wing work, was to replicate the real aircraft safety system for an engine failure. I was also very focused on trying to make the propellers rotate with a 45 degrees offset, but you`re right it could be made much more simple. The tail-rotor is used for pitch control when the plane is hovering. When cruising the tail-rotor is stopped and can be folded. Good luck with you crane trials, looking forward to see the progress! Sorry to hear that the engines aren't working but that was quite a challenge. Beautiful aircraft! The detail work is astounding! This is a masterpiece. Great build, great details and a great story. Henrik my friend, you did again a marvelous job on this one. 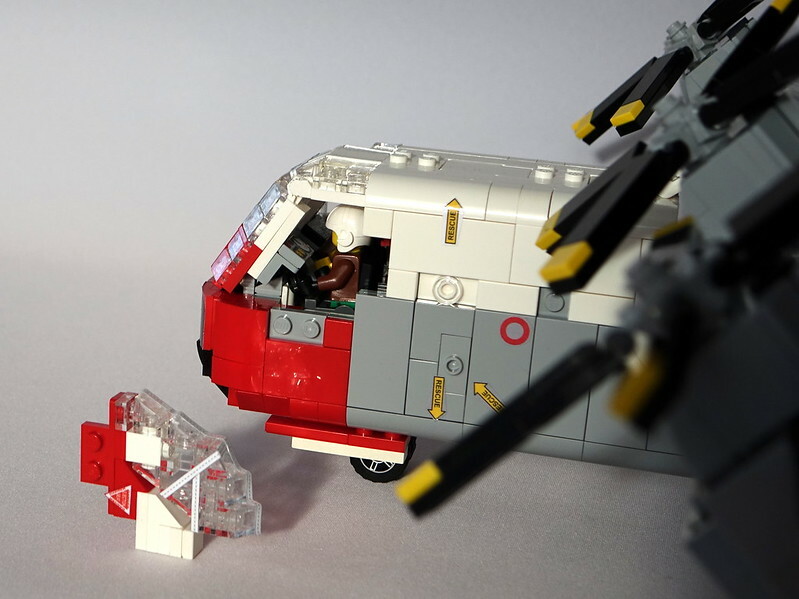 Really like how you manged to build the cabin with all the trans clear parts. Overall a great lookin aircraft with many nice building solutions and functions. Wonderful work. It looks great and the history is excellent. Magnificent job! I love how you made the canopy. The side window looks very intricate. I feel your pain in regards to the axels and gears. Wow, this is amazing! The detail, shaping, colors, mechanisms, techniques.... 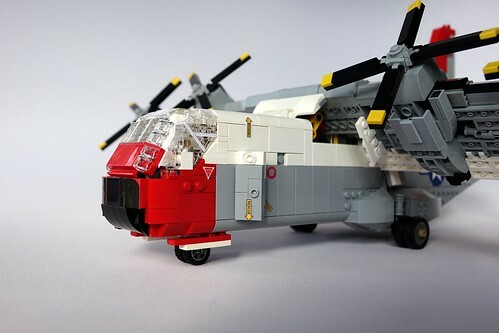 It all meshes together to create this amazing MOC. Good job, and keep it up! Simply terrific, Henrik! When I saw what you chose to model, I thought: Well, it has finally happened --- someone else posted their version before I did mine. I created mine quickly over a year ago, but held it back because I couldn't get LDD to swivel its tilt-wing (sound like a familiar issue in LDD, yes?). My model is smaller and starkly simple (you might think it Duplo, not Lego), but at least I managed to get a movable rear loading ramp. 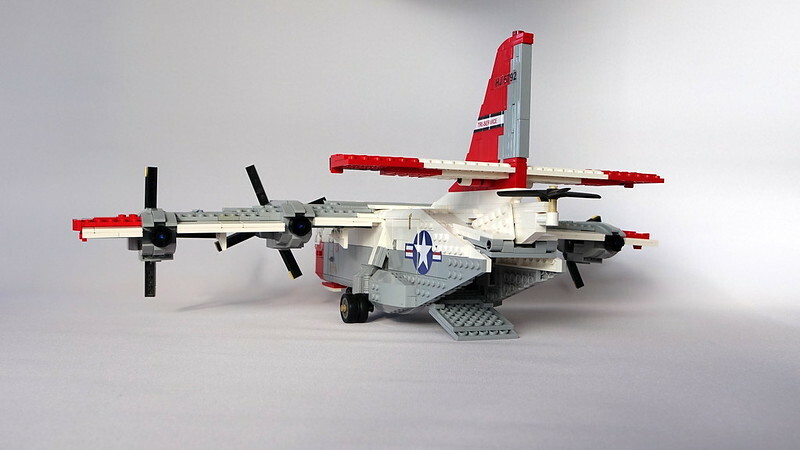 I won't publish mine - I would rather refer people to yours, and right now no one else has the LTV XC-142 on MOCPAGES. You own this space!